My grandson, Army Specialist Bryan Ward was stationed at Fort Wainwright in Fairbanks, Alaska. In May of 2011, he was deployed to Afghanistan as part of the Stryker Brigade Combat Team. In February of 2012, he and 4 others were in a Stryker when it ran over a buried IED. As Bryan was driving he sustained the most injuries and was airlifted to Fort Sam Houston in San Antonio Texas. After 6 surgeries all for broken bones and many metal pins, plates, etc permanently implanted, he has made an amazing recovery. 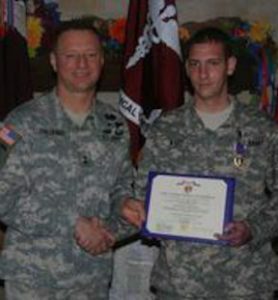 Among other medals and awards, Bryan was awarded the Purple Heart. Unfortunately due to his injuries he will be medically discharged from the Army in the near future and end his military career. He does not regret anything and is proud to have served. While he waits for a medical discharge, Bryan is already taking college classes online and hopes to earn a business degree once discharged. He was able to come home on leave for Thanksgiving and the whole family was grateful for our "miracle". We are all proud of his service and that of his fellow service men and women. We appreciate the sacrifices they make every day. We also appreciate the State of Texas that does so much for our wounded military.